After another valet company walks out of a complicated parking operation at Aventura Marina II; Elite Parking steps in with 4-hour notice. Elite management first worked to organize and stabilize the operation, and then introduced a state-of-the-art, technology SMS Valet software to fully automate the operation. 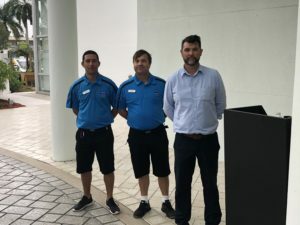 “This SMS system allows residents to request their car via the app on their phone and even validate their guests parking fees through the app,” said Ruben Pérez-Sánchez, Managing Member at Elite Parking. SMS stands for short messaging system and is the world’s first paperless valet system. The patent­-pending technology allows parking management to streamline operations and expedite the valet process. The mobile valet system relies on text messages for vehicle registration, so paper tickets are not necessary. Guests can request their vehicles by simply replying to an initial text message they receive at check-in. Elite Parking is very familiar with both residential, hotel and multi-use parking management. They are highly-versed in the latest parking technology, including efficient mobile management systems and cloud surveillance. 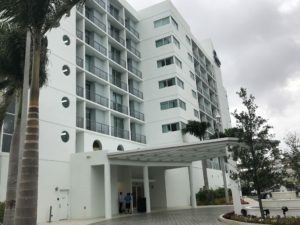 All of their staff goes through an extensive hiring process, which is followed by ample training, to make sure that all personnel are professional and know how to cater to each resident or guests needs. 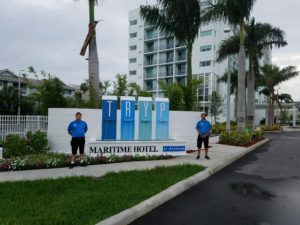 Elite Parking recently acquired the contract to provide valet and parking management services to Wyndham Hotel’s brand new TRYP located in Ft. Lauderdale. 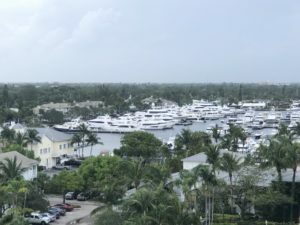 The hotel is located in the “Boating Capital of the World,” the city’s premier luxury yacht marina. The stylish hotel and its sophisticated amenities embrace the nautical lifestyle and tropical beauty that make South Florida so popular. “It’s exciting to be aligned with a brand that carries a name of excellence in both the resort and travel industry. We look forward to upholding the company’s vision of five- star service to guests from the moment they check-in to the moment they depart,” said Elite’s Managing Member, Ruben Perez-Sanchez. TRYP by Wyndham offers guest’s a variety of amenities including an outdoor spa, mini basketball court, a fitness center, a sports movie theatre, business conference rooms, a business center and access to waterfront dining. 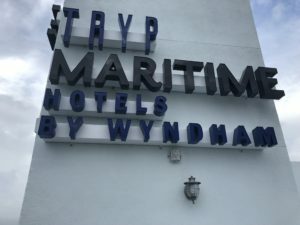 TRYP by Wyndham Maritime also anchors the 168-slip Marina Bay Resort, one of leading upscale marinas in Southeast Florida that can accommodate mega yachts and offer charter boat rentals. Elite Parking provides reliable residential parking services to high-end condominium and hotel properties. The residential group has years of experience working in Florida with developers, condo associations and building owners, and understands the fiscal requirements and works within each client’s budgets. All of Elite’s staff members are trained extensively in the hospitality industry and will make sure all residents receive a seamless parking experience. Elite Parking wants to congratulate Armand Pierre Adlain for receiving June’s employee of the month! 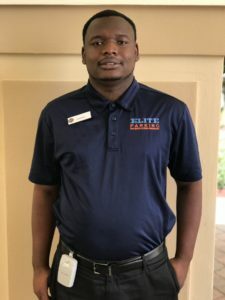 Adlain started with Elite Parking a little over a year and a half ago and is presently the valet at two of Elite’s properties, Mediterranean Village and Aventura Marina II. As a valet driver at Elite Parking, he handles all areas of valet operations which include: park and retrieve cars, manage tickets, check and verify cars for damage; greet residents; collect fees; manage the valet podium; organize vehicles; manage parking area (barricades, directing traffic, etc. ); adhere to the property management’s expectations and build a great relationship with both the property management and their residents by providing “white glove service”. Adlain is originally from Haiti, but has spent much of his life and graduated from high school here in Miami. When not working, he enjoys spending time with family; his wife and daughter. Adlain is also an experienced electrician who provides his services to homeowners in his spare time.